We’re here to provide direct help to children in BC with special needs. Review the eligibility criteria below to see if your child may qualify. If so, click "apply now" to begin the conversation. Variety BC will be periodically reviewing its grant priority areas throughout the year. We encourage families to regularly check back for the latest updates on granting and eligibility criteria. Children from birth to their 19th birthday. B.C. or Yukon resident for a minimum of three months with a valid Health Care Card. Qualified special need (medical/developmental) as recognized by a designated professional. Financial circumstance that limits the ability to afford the item or service required (Variety is currently able to consider requests from households with an annual income of up to $65,000). We’re here to help you every step of the way through our confidential application process. To better serve your needs, Variety BC is currently updating our application system. While we undergo this process, all grant requests will temporarily be vetted via email. Please carefully follow the instructions below to ensure your request can be reviewed as soon as possible. We apologize for any inconvenience. Carefully review the eligibility criteria above, as well as our current grant priority areas. Click “Request an Application” at the top of the page. in the email body, please outline the details of your request, including the name and age of your child, diagnosis/special need, and the specifics of your grant request. If it is possible that we can meet your needs, we will send you an application. We will review you application and let you know the status. Variety steps in where healthcare ends. 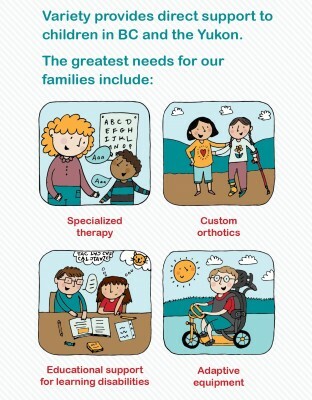 Individual grants are designed to be flexible to allow you to apply for the items that best meet your child’s needs. As every child is unique, so is every application and each is reviewed on an individual basis. Variety aims to fill the gaps which are not covered by government programs, healthcare or private health plans. Sometimes, Variety tops up funding where another agency cannot fund the entire cost. An example would be a partial contribution towards vehicle modifications. Who can apply for an Individual Grant? What if the Government can fund the item I am applying to Variety for? Where the Government can fund the item requested (partial or full), Variety requests that you apply to the Government for that particular item first. Variety will consider top ups, by providing funding for items that the Government or private healthcare plan will not cover fully. Variety may consider interim funding for services with an extended wait-time. Written confirmation is required confirming any of these situations. Variety's funding is always based on what funds are available. We will consider one application per year, per child and must be completed within one year. Your priorities must be listed on the application for Variety's consideration. - Compliance with our policies and guidelines does not guarantee funding of any application. When to apply or re-apply? Most requests for individual grants are considered year round. Exceptions: Tuition is reviewed August 1 to October 31 only. Applications for individual grants may be made one time each year and will be given one year to complete from the time of approval. Grants are valid for one year and anything unused will be returned to our general funds to support other families. Your "anniversary" date is the start date. Variety requires a new application and supporting documents annually. All requests for new or renewals start at www.variety.bc.ca. While you may re-apply before your end date to avoid a lapse in your child's therapy, new start dates will not be issued before your anniversary date. Who can complete an application? An application can be started by a parent/caregiver, healthcare professional, social worker, support worker, teacher etc. but must be signed and submitted by the primary parent/caregiver. Variety - the Children's Charity of B.C. respects and upholds an individual's right to privacy. Please refer to our Privacy Code of Ethics. A child's information/application will be maintained as a confidential, secure record. Information regarding the status of any application will only be share with the family unless written permission has been provided to Variety. 3. Current Notice of Assessment (NOA) from Revenue Canada for each adult (household) contributor that shows net income or Canada child tax benefit (CCTB) statement that shows net family net income. (T4 slips, T1 summaries or pay stubs will NOT be accepted). If parents are separated and one is still contributing significantly to the child's needs (but living outside the household), their NOA is also required. 5. Additional supporting documents are also required with applications depending on the request. This list will be provided with each application form. We regret that applications with any missing information or documents will not be considered. If your application is incomplete, you will be advised. What is the Individual grant process once an application has been submitted? 1. A member of Variety's Grants Team will confirm receipt of application. 2. We regret that applications with any missing information or documents will not be considered. If your application is incomplete, you will be advised. 3. Based on the volume of applications received, we endeavor to review applications within four to six weeks of receipt. 4. If approved, the family will receive an approval in writing. Does Variety choose the therapists or vendors for my child? Variety asks that the family choose their own therapist or vendor for that which they are applying. A therapy, tutoring plan and quotes are required with each application. How are payments to vendors or service providers made? Variety pays all vendors/service providers directly for services or adaptive equipment which has been approved. Families are only responsible for attending appointments and/or maintaining equipment etc. Variety will not reimburse for any services or equipment prior to an approval in writing which includes the start (anniversary) and end dates of a grant. Variety can only work with approved Canadian vendors and approved, certified service providers who can be invoiced directly. How does a student qualify for a tutoring or tuition bursary? Variety's tutoring and tuition bursaries are intended to support children with learning disabilities. Variety uses the Ministry of Education "Q" designation for learning disability to determine if a child qualifies. This is indicated on a child's Individual Education Plan (IEP) or psycho-education assessment. One of these must be submitted with an application. Are paper copies available of the application? Variety can provide a paper copy of our application for those who do not have a computer. Please contact our office and a Grant Team Member will be happy to assist you. To help those most in need, Variety requires with each application, a current Notice of Assessment (NOA) from Revenue Canada for each adult (household) contributor that shows net income or Canada child tax benefit (CCTB) statement that shows net family net income. (T4 slips, T1 summaries or pay stubs will NOT be accepted). If parents are separated and one is still contributing significantly to the child's needs (but living outside the household), their NOA is also required. What does my income level have to be to qualify for funding? Variety aims to support families most in need. We will consider a total net household income of up to $65,000.00 per year. Canada Revenue Notice of Assessment is required with each application.